You know, there are quite a few options for collecting knives. Handle types, series, pattern styles, the world’s your oyster. 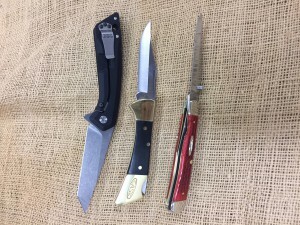 But today’s quick blog focuses on a more practical aspect, a look at locking knives. Now locking knives, as the name suggests, are folding knives that, when open, “lock” into place to stop accidental closings by putting pressure on the spine of a blade, or other such things. There are three main types of locking mechanism on knives, and I’ll show them, give a brief rundown of them, and then offer some examples. Ok, one of the most common locking blade by a landslide is what’s known as a Lockback. This style has a lock on the spine of the backspring, and a notch on the blade latches it in place, and then when you’re ready to close it, you simply push down on the exposed part of the spring to disengage the lock. Some examples of this style of lock are the Copperlock, the Tribal Lock, and the aptly named Lockback. Another one you see fairly often is the Liner Lock. It’s a pretty common style in more modern tactical knives, and, in regards to Case knives, you’ll find them in the Russlock, Mid Folding Hunter, and Trapperlock pattern. How they work is one of the liners is cut and bent to act as a sort of spring, which, when the knife is open, locks it in place. This sort of locking style knife is common due to its ease in production and the ease in operation, as it’s one of the most familiar locks, ergo people almost instantly move to operate folding knives with the liner lock as the rule in regards to closing it. Last on the listing of typical locking knife styles is the Frame Lock. This lock is very similar to the liner lock, in regards to the design swings to the side. There’s a cut along the axis of the spine which creates inward pressure, catching the tang of the knife and locking the blade in place. The only real currently produced Case knife that uses a frame lock is the collaborative work with Southern Grind, the Flipper. There’s a good number of situations where a locked blade can come in quite handy.